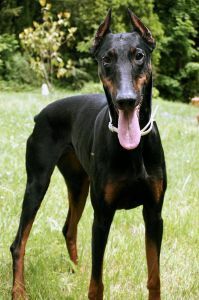 The Doberman Pinscher is one of the most popular dog breeds. They were originally bred as guard dogs and watch dogs for use around the home. They were bred to be quite vicious originally and many people think of them in this regard today. They are a very loyal, intelligent and alert dog. They make a great family companion. If you are committed to training and socialization you will be rewarded with a great dog. A well trained and socialized Dobermann will show no signs of aggressiveness and will only attack if it or its family is threatened. As a highly intelligent dog they are very trainable so this should aggressiveness should not be a huge concern if you are prepared to learn to train your dog properly. As an energetic, Working Dog Breed, they are well suited for sporting competitions like agility. They can also be used for search and rescue. If you are active you will enjoy this breed since it can jog with you and play catch with you. They do need lots of activity and will not have good behavior without enough exercise. This is a medium sized dog standing between 24 - 28 inches (61 to 72 cm) and weighs between 60 and 100 pounds (27 and 45 kg). They normally have short, thick, fur that is often black or brown. Their ears are thin and the tail is naturally long. Docking does occur in many areas still. Because they have such short coats they are best kept indoors. They can not tolerate the cold very well and they have trouble with too much sun!